In the spring of 1851, three leading women's rights activists, Elizabeth Cady Stanton (1815-1902), Cady's cousin, Elizabeth Smith Miller (1822-1911), and Amelia Jenks Bloomer (1818-1894), editor of the Lily, a Ladies' Journal Devoted to Temperance and Literature, wore similar outfits on the streets of Seneca Falls, New York-ensembles consisting of knee-length dresses over full trousers. In nineteenth-century America, trousers were an exclusively male garment, and women wearing trousers in public caused a sensation. The national press quickly linked this dress reform style to Amelia Bloomer, who had been writing articles about it. Soon both the costume and its wearers were popularly identified as "Bloomers." "Our skirts have been robbed of about a foot of their former length, and a pair of loose trousers of the same material as the dress, substituted. These latter extend from the waist to the ankle, and may be gathered into a band … We make our dress the same as usual, except that we wear no bodice, or a very slight one, the waist is loose and easy, and without whalebones … Our skirt is full, and falls a little below the knee. " But however closely she was connected with the Bloomer costume by the press and the public, Amelia Bloomer did not invent the style. Bloomer's full trousers gathered in at the ankle were called "Turkish trousers" and patterned after those worn by women in the Middle East. Since the eighteenth century, European and American women had also worn such trousers for fancy dress. 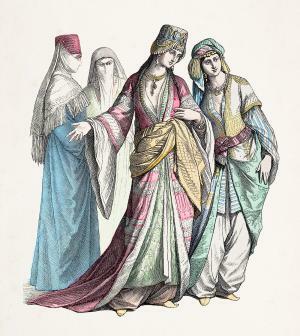 French fashion plates of the 1810s show similar full trousers, called pantalets or pantaloons, peeking out under calf-length fashionable dresses. Although this style was far too daring for American women, by the 1820s children of both sexes were wearing short dresses over narrow, straight-legged trousers, also called pantalets. Boys exchanged pantalets for regular trousers when they grew too old for dresses (typically at five or six), while girls wore them throughout childhood. In their late teens, girls graduated to long dresses and continued to wear pantalets as underwear beneath their skirts. Amelia Bloomer credited Elizabeth Smith Miller with introducing the freedom dress. There are differing accounts of how Miller came to design her outfit, but it is likely that Miller was aware of similar attire worn by women in utopian communities or sanatoriums. Beginning in 1827 with Community of Equality in New Harmony, Indiana, women in several American religious and utopian groups wore straight-legged trousers like children's pantalets under knee-length loose-fitting dresses. Variously styled similar outfits were also promoted for women performing calisthenic exercises and patients at water cure sanatoriums. 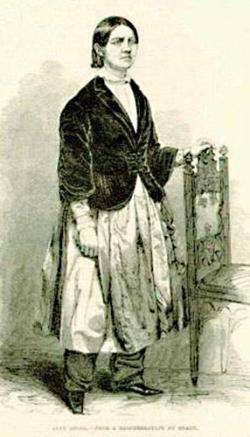 These early instances of women wearing short dresses over trousers did cause occasional comment in the press, but because the garments were worn in closed societies or in women-only situations, they did not challenge the basic social order, unlike the public displays of the Bloomer costume in the 1850s. The initial press coverage of Bloomer wearers during the summer of 1851 was not completely negative but before long the reality of women publicly wearing trousers brought out underlying fears of gender role reversals. In a society based on male dominance and female submission, men saw the Bloomer costume as a threat to the status quo and male leaders from newspaper editors to ministers decried the fashion. Satirical cartoons depicted Bloomer-clad women as crude louts indulging in the worst male vices or bossy wives holding sway over their husbands. Although women's rights activists generally favored dress reform, they came to view the Bloomer costume as a counterproductive force. When activists lectured wearing the Bloomer costume, audiences focused on the controversial trousers instead of radical change in women's education, employment, and suffrage. Consequently, by the mid-1850s, most women's rights advocates had stopped wearing the Bloomer costume in public. Amelia Bloomer herself continued to wear it until 1858, when she cited a move to a new community and the newly introduced cage crinoline, which eliminated the need for heavy petticoats, as the reasons she abandoned the freedom dress and returned to long skirts. The Bloomer costume and a similar outfit called the American costume, which featured mannish, straight-legged trousers, were viable alternatives to constrictive fashionable dress during the second half of the nineteenth century. Although the number of women who wore such attire in public was very small, there are accounts of Women wearing it in private when doing housework, farming, or traveling, especially in the west. Yesterday afternoon, Main street was thrown into intense commotion by the sudden appearance … of a pretty young woman, rigged out in the Bloomer costume-her dress being composed of a pink silk cap, pink skirt reaching to the knees and large white silk trousers, fitting compactly around the ankle, and pink coloured gaiters…. Old and young, grave and gay, descended into the street to catch a glimpse of the Bloomer as she passed leisurely and gracefully down the street, smiling at the sensation which her appearance had created. The boys shouted, the men laughed and the ladies smiled at the singular spectacle…. Few inquired the name of the Bloomer, because all who visited the Theatre during the last season, recognized in her a third or fourth rate actress, whose real or assumed name appeared in the bills as "Miss O'Neil." During the Season, however, we learn she severed her connexion with Mr. Potter's corps of Super numeraries and entered a less respectable establishment in this city. Richmond Dispatch, Tuesday, 8 July 1851, p.2, c.6. In 1858 Godey's Lady's Book promoted a Bloomer-style costume for calisthenics and similar clothing was worn as bathing costume. Physical training educators used the Bloomer costume as a prototype in developing garments for increasingly active women's sports programs. The full trousers themselves became known as bloomers and, by the 1880s, were an essential element of the gymnasium or gym suit; short bloomers continued to be worn as part of gym suits into the 1970s. Bloomers reappeared in public during the bicycling craze of the 1890s, now worn as part of a suit with a jacket instead of a short dress. Women wearing bicycling bloomers in the 1890s were less controversial than when Amelia Bloomer and her friends donned their famous outfits in the 1850s, but not until the mid-twentieth century did women routinely wear trousers in public without criticism. See also Dress Reform; Fashion Gender and Dress; Trousers. Bloomer, Amelia. The Lily, a Ladies' Journal Devoted to Temperance and Literature. The February, March, April, May, and June 1851 issues of The Lily have articles by Amelia Bloomer related to female dress reform. Cunningham, Patricia A. Reforming Women's Fashion, 1850-1920: Politics, Health, and Art. Kent, Ohio, and London: Kent State University Press, 2003. Comprehensive social history of women's dress reform with an excellent overview of the role of the Bloomer costume. Fischer, Gayle V. Pantaloons and Power: A Nineteenth-Century Dress Reform in the United States. Kent, Ohio, and London: Kent State University Press, 2001. Detailed analysis of the cultural role of trousers in nineteenth-century American society. Sims, Sally. 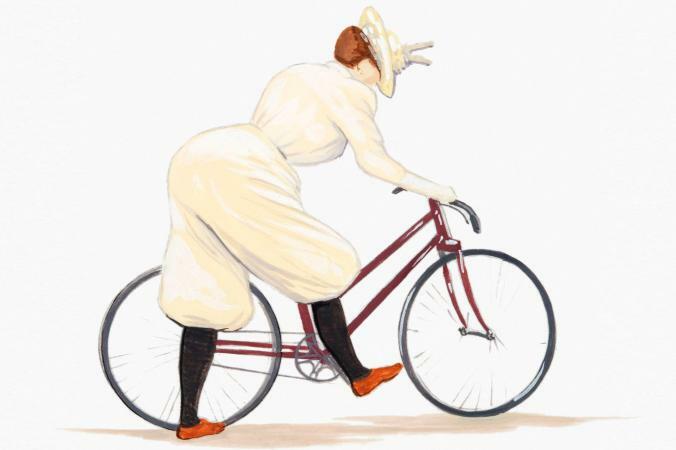 "The Bicycle, the Bloomer and Dress Reform in the 1890s." In Dress and Popular Culture. Edited by Patricia A. Cunningham and Susan Vosco Lab, 125-145. Bowling Green, Ohio: Bowling Green State University Popular Press, 1991. Article about women wearing bloomers during the bicycle craze of the 1890s.